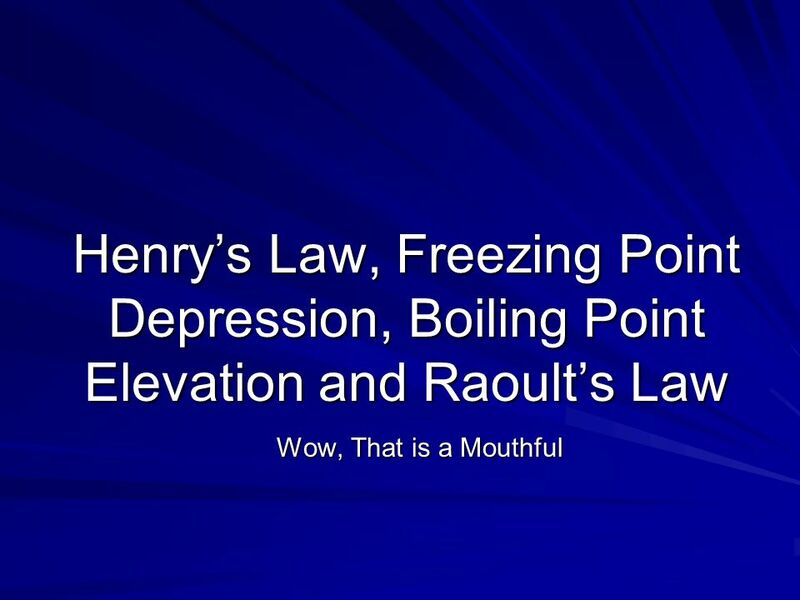 Henry’s Law, Freezing Point Depression, Boiling Point Elevation and Raoult’s Law Wow, That is a Mouthful. 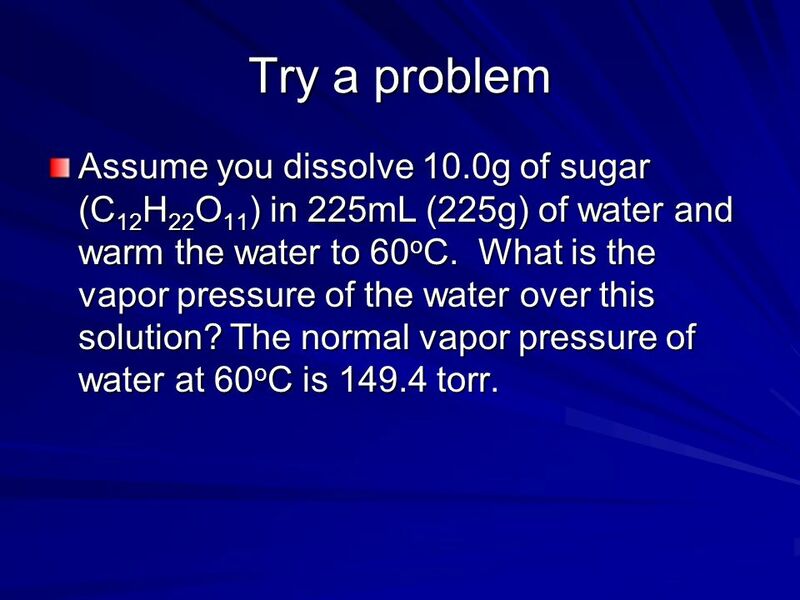 8 Try a problem Assume you dissolve 10.0g of sugar (C12H22O11) in 225mL (225g) of water and warm the water to 60oC. What is the vapor pressure of the water over this solution? The normal vapor pressure of water at 60oC is torr. 10 Why does this matter? 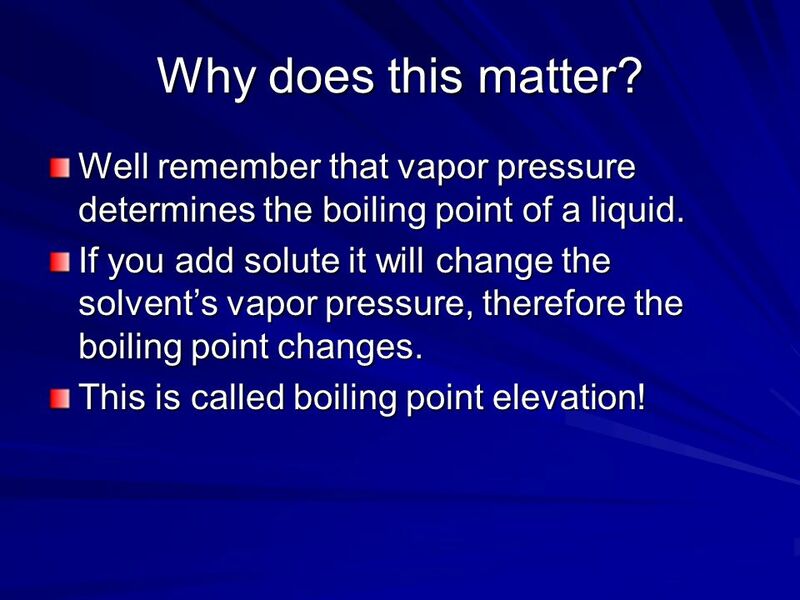 Well remember that vapor pressure determines the boiling point of a liquid. 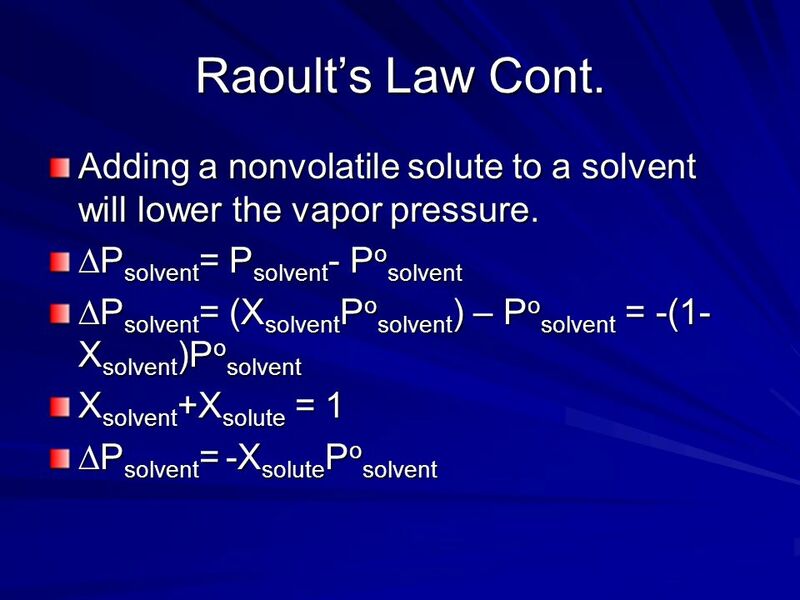 If you add solute it will change the solvent’s vapor pressure, therefore the boiling point changes. 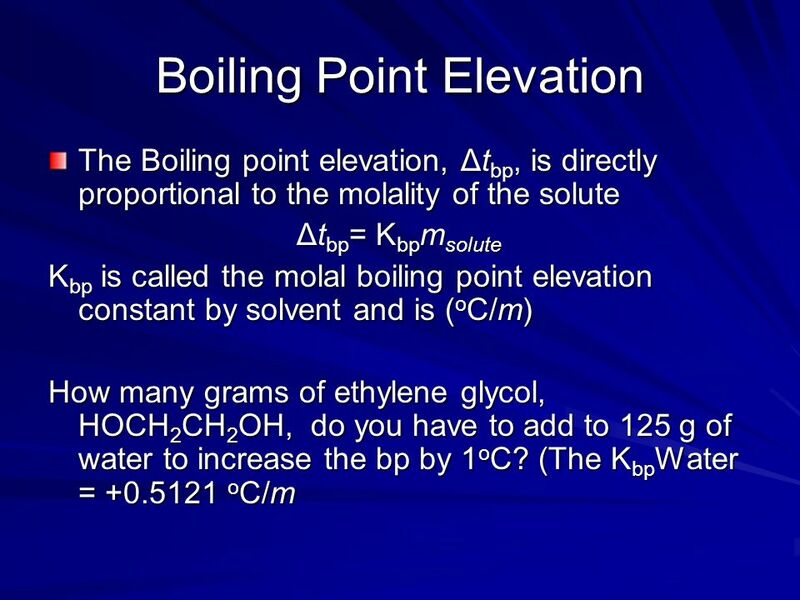 This is called boiling point elevation! 12 What is another use? 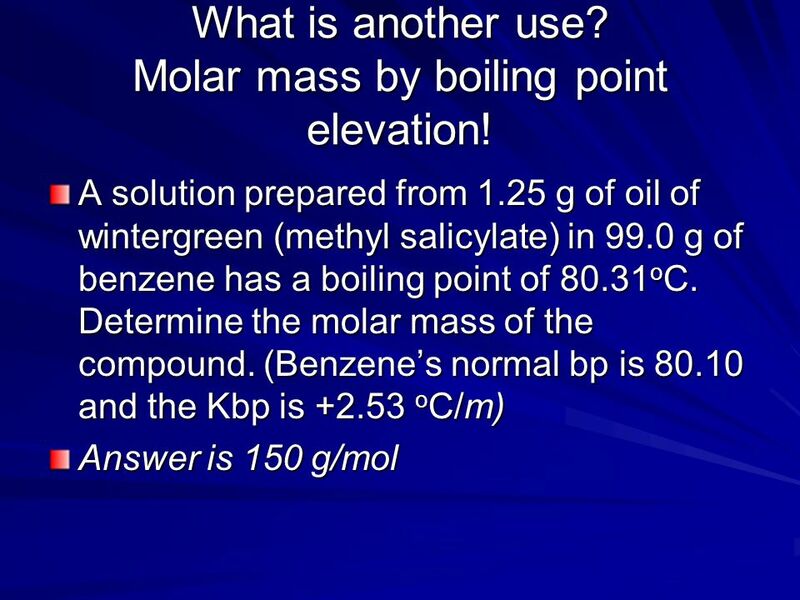 Molar mass by boiling point elevation! 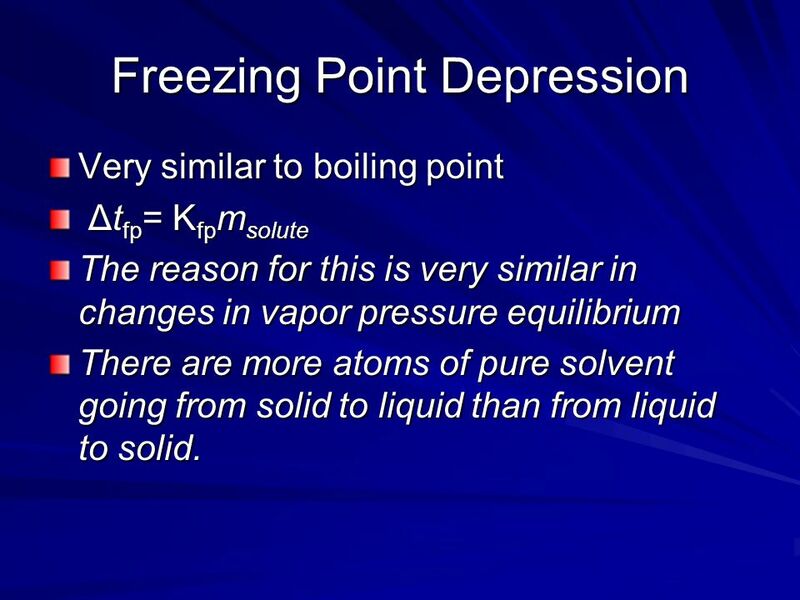 Very similar to boiling point Δtfp= Kfpmsolute The reason for this is very similar in changes in vapor pressure equilibrium There are more atoms of pure solvent going from solid to liquid than from liquid to solid. 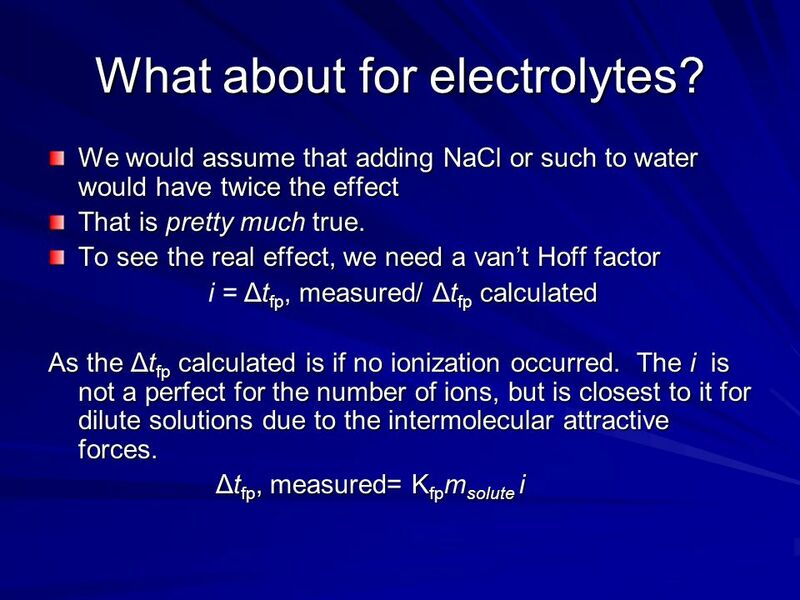 14 What about for electrolytes? 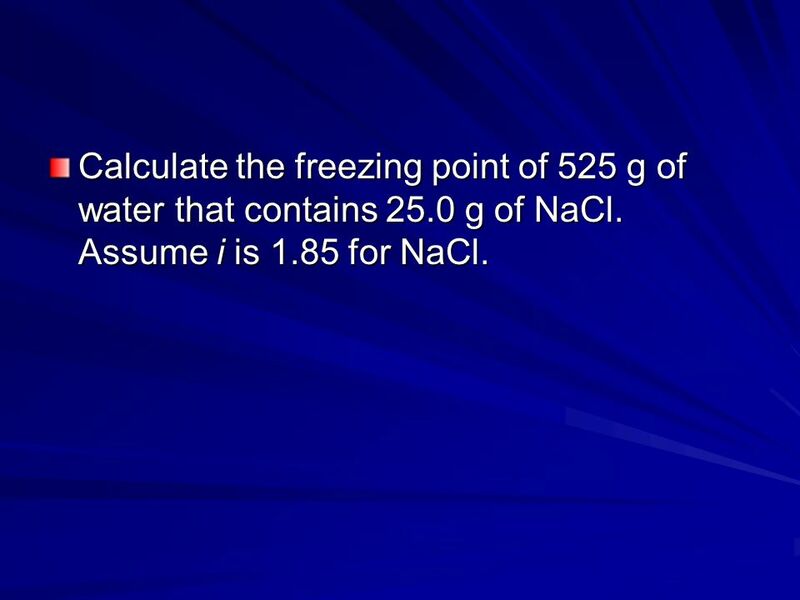 Calculate the freezing point of 525 g of water that contains 25.0 g of NaCl. Assume i is 1.85 for NaCl. 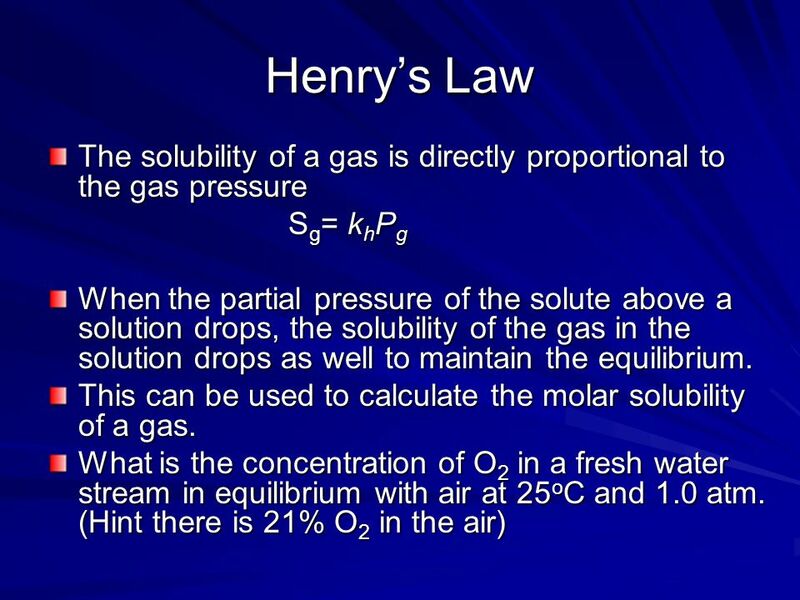 Download ppt "Henry’s Law, Freezing Point Depression, Boiling Point Elevation and Raoult’s Law Wow, That is a Mouthful." CHAPTER 14: SOLUTIONS AND THEIR PROPERTIES  SOLUTION homogeneous mixture of two or more substances in a single phase.  Solvent component present in. 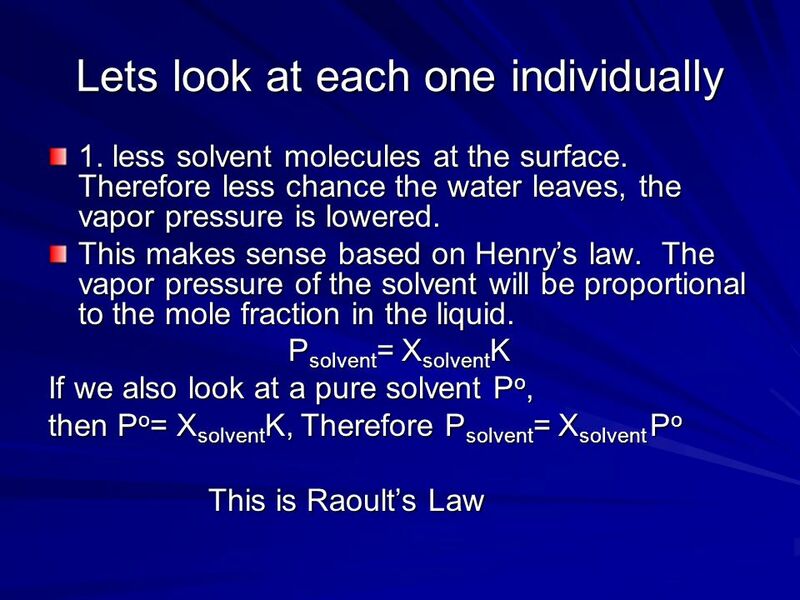 Chapter 11 Properties of Solutions Solutions – homogeneous mixtures that could be gasses, liquids, or solids. Let’s remember the terms… Dilute – relatively. © 2009, Prentice-Hall, Inc. Colligative Properties Changes in colligative properties depend only on the number of solute particles present, not on the. Chapter 12 Properties of Solutions. Liquids 2 Properties of Liquids A. Viscosity B. Surface Tension. 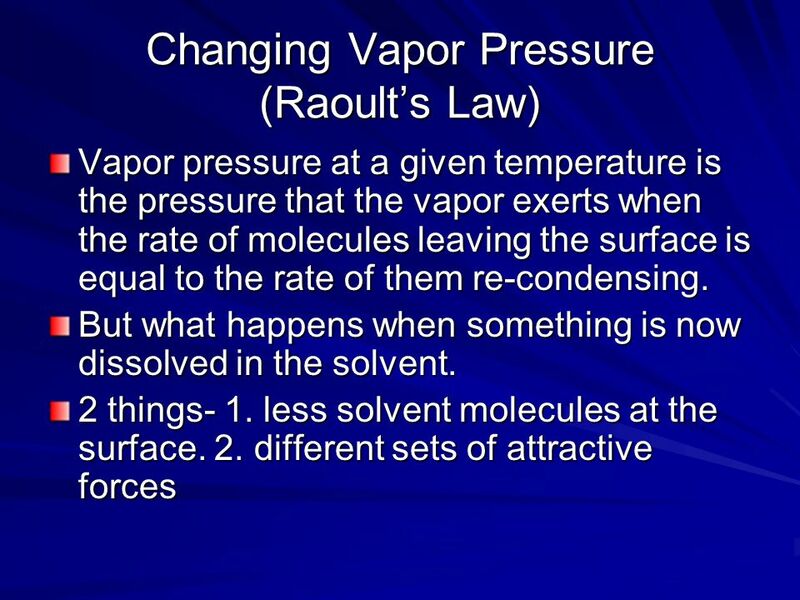 Colligative Properties Vapour pressure Boiling point Freezing point Osmotic pressure. Chapter 12. Remember that a solution is any homogeneous mixture. 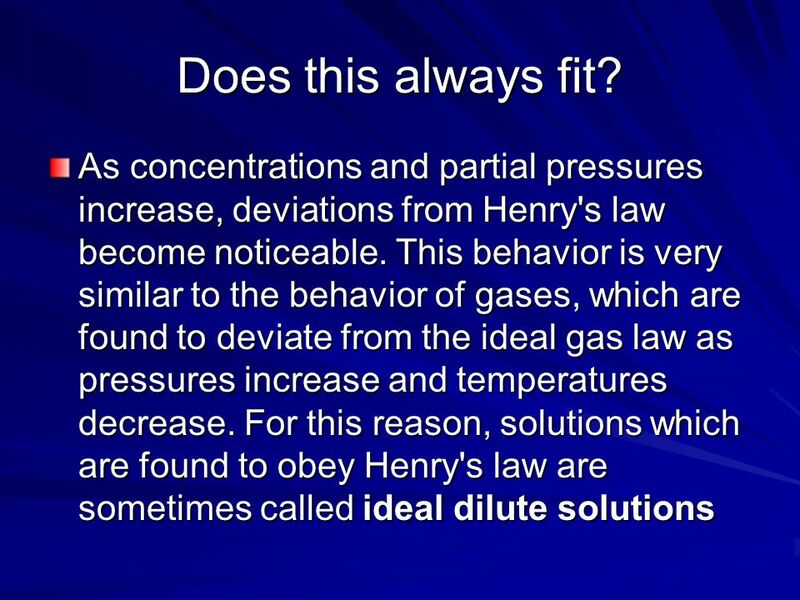 There are many types of solutions: SoluteSolvent Resulting Solution Examples gasgasgasair. Solutions. 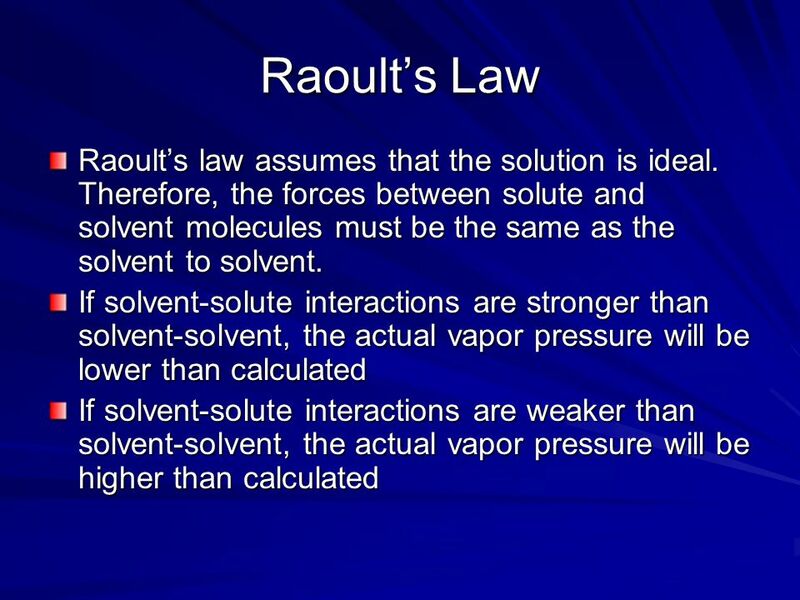 Occur in all phases u The solvent does the dissolving. u The solute is dissolved. 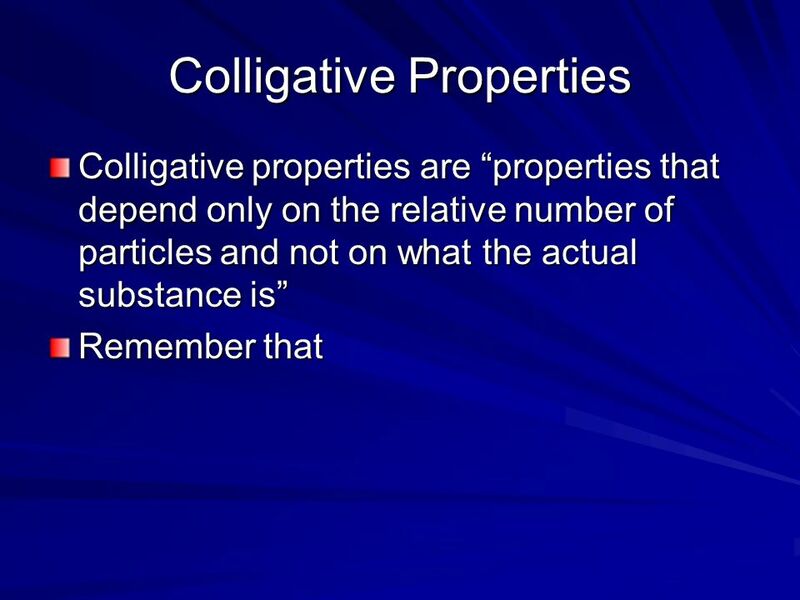 u There are examples of all types of solvents dissolving. Chapter 141 Solutions and Their Behavior Chapter 14.